The refined, ultra-compact Titan® Plus builds upon our groundbreaking Titan, the world’s first professional-grade keychain flashlight, by adding several useful "pluses,” including more than twice the maximum output—300 lumens of flawless white light! 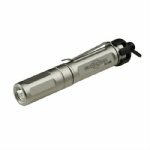 Its high-performance LED also generates two other useful light levels with a simple twist of the head switch: 75 lumens at its medium setting and 15 lumens on low. No matter which output level you select, our proprietary faceted reflector shapes the LED’s light into wide, smooth MaxVision Beam™. And, because there are no intense hot spots and it’s optimized for your field of view, you see things clearly and maintain good situational awareness—crucial for closer-range tasks and safe navigation.